HP Tuners offers performance solutions at your fingertips with their VCM MPVI2 Suite MPVI2 Standard packages. The MPVI2 module, combined with an HP Tuners VCM Editor and Scanner, make up the essentials of the VCM Suite packages giving you one of the most powerful scanning, diagnostic, logging, and calibration performance tools on the market to ensure that you capture everything. Unleash your vehicle's full potential with one of these VCM Suite MPVI2 Standard packages by HP Tuners! Includes 4 universal credits. MVPI2 Module comes equipped with enhanced features like Bluetooth, a proprietary expansion port, and mobile device support. (the powerful MPVI2 makes it faster, easier to read, edit, and write your vehicle's software). VCM Editor packaged together with MPVI2 allows you to read most vehicles control modules flash memory and save it in our proprietary .HPT file structure. VCM Editor enables you to adjust a multitude of complex parameters such as torque strategies, spark tables, fueling, RPM limits, fan activations, transmission shift points and pressures, exhaust valve control, speedometer settings and many more. Finally, you can write these changes back to the various vehicle control modules via the MPVI2. VCM Scanner is a fully featured OBD-II scanning and diagnostic tool that allows you to view, chart, and log data in real time via the vehicle's OBDII diagnostic data port (also view and clear vehicle DTC's), along with other vehicle module info. Command control functions like closed loop, fans, gear select, timing, air fuel ratio and so more all in real time. No editor package can be considered complete without comprehensive scan tool capabilities. Please be aware that this is a powerful programming tool. It will unlock the onboard ECU on the vehicle being tuned to the point where an inexperienced tuner may inflict engine damage accidentally. There are no built-in safeties. Quantity: Sold as a package. 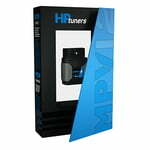 All new HP Tuners products carry a 6-month warranty from the date of purchase. This warranty shall become void if your HP Tuners product: has been modified or repaired in a manner not previously authorized by HP Tuners in writing; was subjected to accident, abuse, theft, or improper use; was not used or configured as specified in the product manual; was subjected to operating conditions more severe than those specified in the product manual or exposed to water and/or extreme heat; or identification markings have been removed, defaced, or altered.